Steve Bannon, former chief strategist to President Trump, has stepped down from Breitbart, the far-right website he returned to over the summer as executive chairman after being ousted from the White House. "I'm proud of what the Breitbart team has accomplished in so short a period of time in building out a world-class news platform," Bannon is quoted as saying in the article. Addressing staffers in the company's internal Slack channels, Breitbart CEO Larry Solov wrote, "Steve Bannon has decided to step down from Breitbart News Network. Steve is a valued part of our legacy, and we will always be grateful for his contributions, and what he helped us to accomplish. ... We will continue doing what we do as well as anybody in the world, and that is report the news." A Breitbart employee, who spoke on the condition of anonymity because they were not authorized to discuss the matter, told CNN that "everyone seems stunned." SiriusXM also announced it had ended its relationship with Bannon, saying in a statement, "Breitbart News has decided to end its relationship with Stephen K. Bannon, therefore he will no longer host on SiriusXM since our programming agreement is with Breitbart News." But Bannon drew the ire of the White House last week when The Guardian revealed that author Michael Wolff quoted him in his book "Fire and Fury" as saying a Trump Tower meeting involving Donald Trump Jr., Jared Kushner, and a Russian lawyer during the 2016 campaign was "unpatriotic" and perhaps "treasonous." Trump responded at the time by slamming him in a fiery statement, saying Bannon had "lost his mind." Bannon's comments also threw his future at Breitbart into question. A person familiar with the matter told CNN last week that there was a "hard push" to convince Solov and Susie Breitbart, the widow of the website's founder, to fire Bannon. 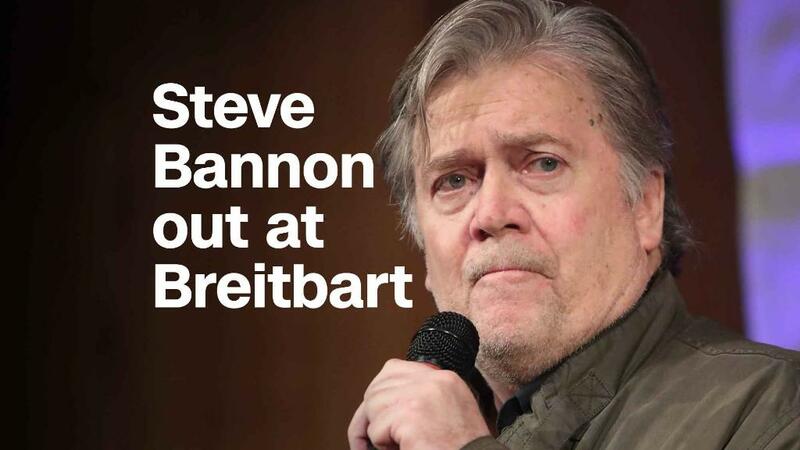 The Wall Street Journal separately reported that Breitbart's board members were debating whether or not to oust Bannon, and last Thursday afternoon Rebekah Mercer, the conservative mega-donor who owns a stake in Breitbart, publicly rebuked Bannon in a rare public statement. Despite this, Bannon had been insistent to allies and others over the last few days that he wasn't going anywhere, people familiar with the situation told CNN. Bannon issued a lengthy statement on Sunday in which he said the comments attributed to him in Wolff's book were not aimed at Donald Trump Jr., but at Paul Manafort, Trump's former campaign chairman. But that statement did not seem to appease Trump, who had dubbed his former chief strategist "Sloppy Steve" and slammed him in a series of stinging tweets. A person familiar with the matter told CNN that Trump viewed the statement as "too little and too late." Flying aboard Air Force One on Monday, deputy White House press secretary Hogan Gildey told reporters, "I don't believe there is any way back for Mr. Bannon at this point." -- CNN's Jeremy Diamond and Kaitlan Collins contributed reporting.